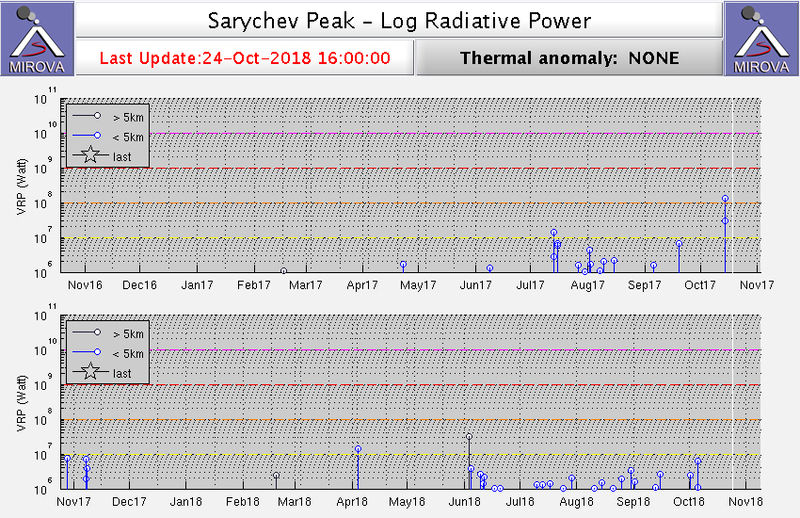 KVERT reported that an ash explosion at Sarychev Peak was last noted on 10 October and a thermal anomaly was last identified on 15 October. The volcano was quiet or obscured by clouds during 16-31 October. KVERT lowered the Aviation Color Code to Yellow (the second lowest level on a four-color scale). KVERT reported that a thermal anomaly over Sarychev Peak was visible in satellite images on 15 October. Weather clouds obscured views on the other days during 12-19 October. The Aviation Color Code remained at Orange. KVERT reported a continuing eruption at Sarychev Peak (the NW part of Mantua Island) through 21 September. Island observers reported explosions at 1010 on 18 September that sent ash plumes to 4.5 km (14,800 ft) a.s.l. Ash plumes identified in satellite images during 17-18 September drifted 265 km E. The Aviation Color Code remained at Orange. SVERT and KVERT reported increased activity and ash emissions at Sarychev Peak in mid-September. A thermal anomaly had been periodically visible since 7 May 2018, though more recently anomalies were detected during 8 and 11-12 September. Explosions sometimes occurred during 11 and 13-15 September, and ash emissions rose 3-4 km (10,000-13,100 ft) a.s.l. On 14 September ash plumes drifted as far as 120 km. On 14 September KVERT stated that the Aviation Color Code was raised to Orange, though on 17 September SVERT noted that the Aviation Color Code was at Yellow. KVERT reported that explosions at 0910 on 17 September generated ash plumes that rose as high as 4.5 km (14,800 ft) a.s.l. and drifted 21 km NE. SVERT reported that a thermal anomaly over Sarychev Peak was identified in satellite images during 6-7 November. Weak steam-and-gas emissions were observed on 8 November. Weather clouds prevented observations during 9-13 November. The Aviation Color Code remained at Green. A NOAA/NESDIS scientist noted that a thermal anomaly at Sarychev Peak was identified in satellite images on 12 October. Robust thermal anomalies were identified on 14 October, and were accompanied by a plume of unknown composition. Thermal anomalies were also recorded by the MODVOLC and MIROVA thermal detection systems. Based on satellite image observations, SVERT reported that steam-and-gas emissions rose from Sarychev Peak on 28 November. Sarychev Peak does not have a seismic network; satellite imagery is the primary tool for monitoring many of the Kurile Islands volcanoes. SVERT reported that a diffuse ash plume from Sarychev Peak was detected by satellite on 20 September. Sarychev Peak does not have a seismic network; satellite image observations are the primary tool for monitoring many of the Kurile Islands volcanoes. SVERT reported that a thermal anomaly on Sarychev Peak was detected by satellite on 27 May. Sarychev Peak does not have a seismic network; satellite image observations are the primary tool for monitoring many of the Kurile Islands volcanoes. SVERT reported that a thermal anomaly on Sarychev Peak was detected by satellite on 25 November. Steam-and-gas emissions were noted on 25, 26, and 29 November. SVERT reported that a thermal anomaly on Sarychev Peak was detected by satellite on 21 November. Based on analyses of satellite imagery, SVERT reported that on 22 July a gas-and-steam plume from Sarychev Peak drifted 35 km N. Cloud cover prevented observations during 23-26 July. On 27 July, a steam-and-gas plume possibly containing some ash rose to an altitude of 3.7 km (12,000 ft) a.s.l. and drifted 55 km NW. Based on analyses of satellite imagery, SVERT reported that gas-and-steam plumes from Sarychev Peak were seen on satellite imagery during 15, 18-19, and 21 July. Plumes drifted 30-50 km W and S. Cloud cover prevented observations during 16-17 and 20 July. Sarychev Peak does not have a seismic network. Based on analyses of satellite imagery, SVERT reported that diffuse gas-and-steam plumes from Sarychev Peak were seen on satellite imagery during 8-10 and 12 July. Plumes drifted 15 km E on 8 July. The plumes seen on 9 July drifted 50 km E and may have contained some ash. Gas-and-ash plumes drifted 40 km E on 13 July and 25 km W and NW on 14 July. SVERT reported that an intense thermal anomaly from Sarychev Peak was detected on satellite imagery during 1-6 July. Gas-and-steam plumes were seen almost daily and drifted 20-75 km NW, NE, and SE. Plumes rose to altitudes of 1.5-3 km (4,900-10,000 ft) a.s.l. during 4-5 July. No large ash explosions were noted after 16 June. SVERT reported that an intense thermal anomaly from Sarychev Peak was detected on satellite imagery during 24-30 June. Gas-and-steam plumes drifted 9 km NW on 24 June, S on 26 June, 26 km SSE on 28 June, and 40 km SE at an altitude of 3 km on 29 June. The eruption from Sarychev Peak that began on 11 June continued through the 19th. SVERT reported another explosive eruption at 1730 UTC on 15 June, followed by the satellite observation of a plume early on 16 June that extended 360 km NW. The Tokyo VAAC estimated that the 16 June plume rose to an altitude of 9.7 km (32,000 feet) a.s.l., while higher ash clouds from earlier explosions reached 13.7 km (45,000 feet) altitude. Ash emissions continued during 17-18 June, causing ashfall in Yuzhno-Sakhalinsk, and gas-and-steam plumes spread NE and SW. Thermal anomalies were detected in satellite data on 18 and 19 June, but cloudy conditions prevented clear observations. One MODIS image on 18 June showed an ash plume spreading SW above the weather clouds. Although the Aviation Color Code was lowered from Red to Orange on 19 June, satellite observations showed that a diffuse ash cloud had spread approximately 20 km S and 40 km W of the volcano. Based on analysis of satellite imagery, SVERT reported that on 11 June a thermal anomaly from Sarychev Peak and a possible diffuse ash plume were detected. Seismicity was at background levels. The next day, a large thermal anomaly was present and ash emissions were were seen on satellite imagery. On 13 June, ash plumes rose to an altitude of 7.5 km (24,600 ft) a.s.l. and drifted 200 km SW and 105 km SE. On 14 June, a large eruption produced an ash plume that rose to an altitude of 12 km (39,400 ft) a.s.l. A large explosion the next day sent an ash plume to an altitude of 8 km (26,200 ft) a.s.l. Sarychev Peak is not monitored with ground-based instruments. According to news articles, some airlines have re-routed, canceled, or delayed flights. Ash emission, accompanied by earth tremors and a booming noise, began in mid-September. On 2 October, volcanologists observed two lava flows moving rapidly down the W flank toward the Sea of Okhotsk. 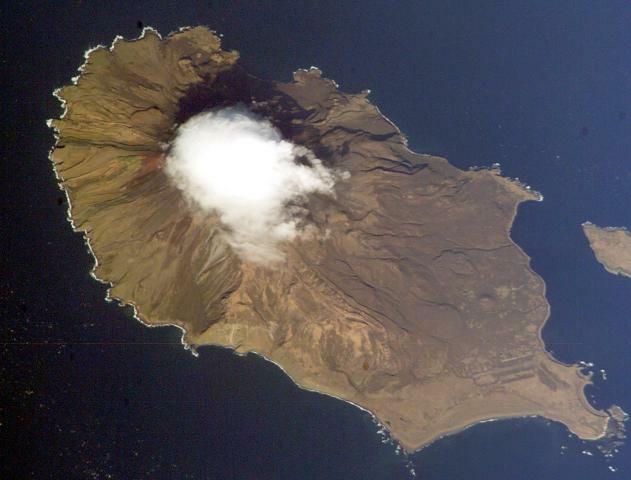 By 16 October, eruptive activity was limited to infrequent "smoke" effusion, allowing the staff of the hydro-meteorological station (the only inhabitants of the island) to return. Volcanologists from the Institute of Volcanology, Petropavlovsk (IVP) are presently studying the volcano. Sarychev had a mild ash eruption lasting only 6 minutes on 9 December 1965. Its last major eruption began on 30 August, 1960, producing a 5-km-high cloud of andesitic basalt ash. Further Reference. Andreyev, V.N., Shantser, A.Ye., Khrenov, A.P., Okrugin, V.M., and Nechayev, V.N., 1978, Eruption of the volcanic peak Sarycheva in 1976: Byull. Vulkanol. Stn., no. 55, p. 35-40. The W walls of the crater were ruined after the 1976 eruption, and this part of the summit was flat during the 20 September overflight. In the central part of the summit crater, there was a shallow but morphologically distinct funnel in which there were many intensely active fumaroles. In September 1986 the staff of a meteorological station on Matua Island reported a strong sulfur smell. During the previous observations, after the 1976 eruption, the crater was described as flat-bottomed with a depth of 50-70 m by Andreyev and others (1978). During the 2 November 1986 overflight only the SE wall remained above the crater. Gas was being emitted from most of the crater, with the most intense fumaroles restricted to its central and W parts. A black, snow-free lava tongue extended 100-150 m from the S part of the crater. Many shallow fumaroles were located in the SE part of the crater and at the head of the lava flow. Gas emission was not observed from the lava flow itself. Traces of ash that fell before September 1986 were noted on the snow-covered crater slopes. The volcano has no permanent snow cover. Reference. Andreyev, V.N., Shantser, A.Ye., Khrenov, A.P., Okrugin, V.M., and Nechayev, V.N., 1978, Eruption of the volcanic peak Sarycheva in 1976: Byull. Vulkanol. Stn., no. 55, p. 35-40. An ash eruption was reported on 14 January at 1136. During an overflight between 1220 and 1250, clouds at 1,300-1,800 m altitude obscured the summit . . . . No eruption columns were observed above the weather clouds. Two narrow gray bands on the volcano's snow-covered N and NE slopes suggested ash emission had occurred the previous day. The activity was preceded by a series of felt earthquakes 5-12 January. Epicenters of some strong earthquakes (M<=6.2) were located in the Simushir Island region . . . .
Information Contacts: G.S. Steinberg, Institute of Marine Geology & Geophysics, Yuzhno-Sakhalinsk. On 11 June 2009 one of the largest historical eruptions in the Kuril Islands began?from Sarychev Peak (figure 1). A report from the Sakhalin Volcanic Eruption Response Team (SVERT) covered events through June, and included both remote-sensing and on-the-scene observations by Russian scientists. Other contributors include astronauts and remote-sensing specialists. Synonyms for the volcano include Fue-san, Matsuwa-jima, Matua-jima, and Sarnicheff. Figure 1. Broad-scale maps of the Kuril Islands showing regional geography and the location of Sarychev Peak. Base maps are courtesy of the Sakhalin Volcanic Eruption Response Team (SVERT). Representative aviation routes on the inset map are from Casadevall and Thompson (1995). Monitoring. Volcano monitoring is conducted by SVERT in the southern and central Kurils, and by KVERT in the northern Kurils (figure 1). The region is well known for severe weather, including summertime cloudy and foggy conditions; volcano monitoring has depended heavily on remote-sensing methods. With respect to civil aviation, the Kuril Islands are the responsibility of the Tokyo Volcanic Ash Advisory Center (VAAC). A zone without designated VAAC jurisdiction over N-central Russia is ~ 1,400 km N. The substantial plumes caused concern about that zone's ambiguous status and the whereabouts of Sarychev's ash. This part of the North Pacific is sparsely populated but is one of the world's most heavily traveled air corridors, crossed by flights linking Europe and North America to northern Asia (including Japan, parts of China, Hong Kong, and Korea). Injecting ash into these flight routes, Sarychev's eruption triggered diversions or delays to an unknown number of flights. Reliable sources indicated that some aircraft diversions over Russia, and other unexpected factors, cost as much as $100,000 USD per flight. Precursors and initial eruption, 11 June 2009. 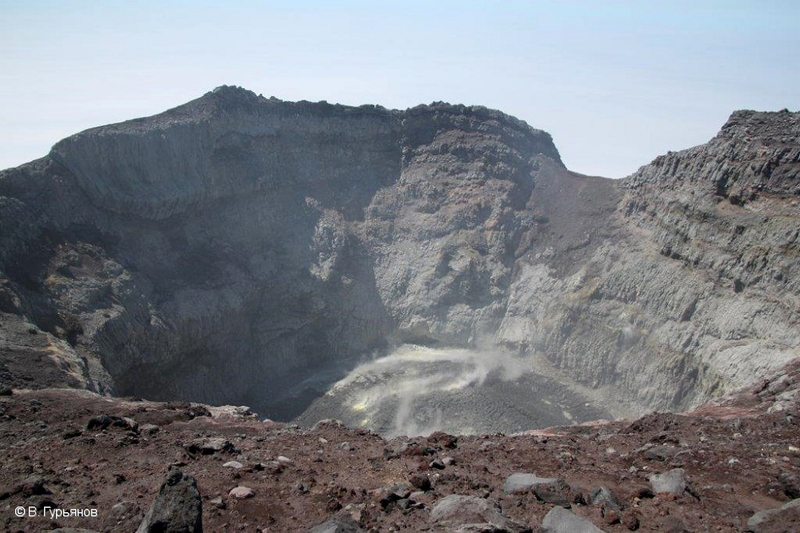 Before the June 2009 eruption the volcano was dormant with substantial fumarolic activity. Visitors looking into the crater in August 2008 encountered thick fog, but did heard noises. On 6 June 2009 specialists came to the island to service an autonomous GPS station. Photographs documented increased gas emissions. 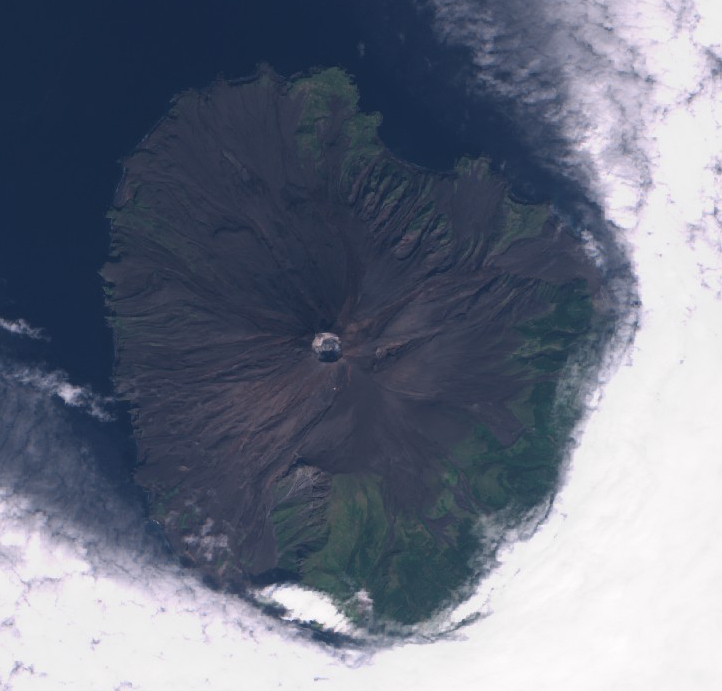 SVERT's report stated that the first signs of eruption came as a result of satellite observations acquired on 11 June 2009. Distinct then were both a thermal anomaly and weak ash emissions. During the eruption, ashfalls were widespread and noted at sites including Raikoke, Rasshua, Ushishir, Ketoi, the Simushir islands, the northern part of Urup Island, and widespread on Sakhalin Island. On the night of 11-12 June, the scientific research ship George Steller passed near the island without anyone noticing an eruption, according to an oral report from the expedition chief Vladimir Burkanov. Space Station photograph, 12 June 2009. A stunning photo of the plume taken on 12 June 2009 (figure 2) from the International Space Station (ISS) shows not only a highly complex ash cloud, but at least two or three distinct (different colored) volcanic clouds hugging the ground surface and traveling radially out from the vent. One is an unmistakable, light-colored pyroclastic flow, narrowing as it progresses out over the island until ultimately hidden by the edge of the weather clouds. Another set are broader, dark-colored clouds, presumably other pyroclastic flows. Figure 2. A digital photograph of a Sarychev Peak's eruption plume taken by astronauts on 12 June 2009 from the International Space Station. N is to the upper right. [Astronaut photograph ISS020-E-9048; acquired 12 June at 22:16 UTC with a Nikon D2XS digital camera fitted with a 400 mm lens; Nadir point 48.8°N, 157.5°E]. Courtesy of NASA Earth Observatory. The vertical plume looks dense and well confined; absent is the strongly spreading upper region common in many eruptive plumes (an umbrella cloud). The top of this cloud is bulbous, and trailing below it is a narrower, columnar lower segment colored in shades of brown and cream. At the time of this writing no clear analysis of the plume height has come to our attention. Older dispersed plumes are also apparent at distance (some at the left edge of this photo) and on satellite imagery from 12 June, with airborne ash covering a considerable area and extending in more than one direction. Capping the ash cloud's bulbous top and in a ring just below it, lies a strikingly smooth, white portion of the plume, a feature called a pileus cloud (figure 2). It results from a slab of uncontaminated air pushed upward ahead of the rapidly rising darker zone. Pileus clouds sometimes form above mountain tops and convectively rising weather clouds. For the pileus cloud to form, the lifted air layer must have sufficient moisture (relative humidity). The underlying clouds often punch through the pileus clouds, a process that seems to have started here. The lower clouds that result are sometimes described as cloud skirts (the ring in this case). The hole in the weather clouds centered above the volcano is likely in part due to meteorological conditions; such holes often occur similarly centered over islands in the Kuril chain. This may result, for example, from an island's landmass warming moist air or forcing it upwards to mix with dryer air, resulting in a local loss of cloud cover; such an effect might combine with downwind eddies. A broader 12 June ISS image shows a series of holes in regional weather clouds in a pattern aligned broadly over the Kuriles. Another explanation, with many adherants, is that the hole may have been caused or influenced by effects associated with dynamics of the eruption and plume propagation (Wilkinson, 2009). The opportune ISS flyover resulted in 29 still images of the eruption taken over a 1-minute interval. NASA used the photos to create a series of animations, also available on the NASA Earth Observatory website. The ISS orbits at ~ 400 km altitude and ~ 27,500 km/hour. Patrick Vantuyne created a red-blue stereo image of the 12 June plume, posted by NASA as a "Picture of the Day." Satellite-based observations. SVERT reported that the energetic phase of the eruption, during 11-16 June, encompassed more than ten large explosions (figures 3 and 4). Resulting ash clouds rose up to altitudes of 8-16 km and, according to some estimates, up to 21 km. Ash plumes stretched N to W for 1,500 km, and E for more than 3,000 km. Comparative analysis of ASTER-Terra satellite images indicated newly formed territory amounted to 1.4 km2. The area of island covered by June 2009 pyroclastic flows was more than 8 km2. The preliminary estimated minimum volume of eruptive rock was 0.4 km3. Figure 3. A MODIS satellite image of the Sarychev Peak eruption plume from 16 June 2009. In colored versions the plume is black. As it spread W, part of the plume took the form of a large spiral, portions of which extended at least as far W as Sakhalin Island. The plume also appears in thinner strands to the NE of the source. Courtesy of SVERT and MODIS. Figure 4. 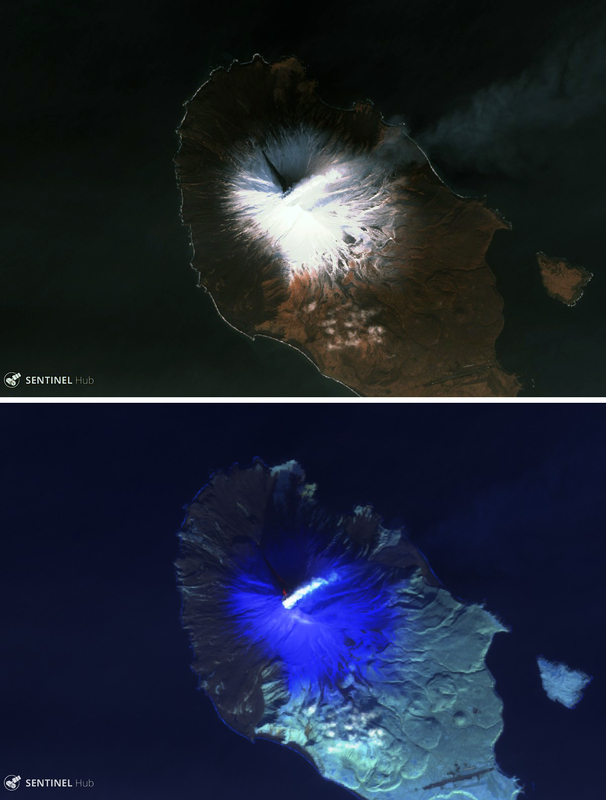 False-color ASTER images from 27 May 2007 and 30 June 2009 showing before-and-after scenes of Sarychev Peak's eruption. The 2007 photo shows remnant seasonal snow on the island and some cloud over the summit. N is towards the top and the long-axis of Matua (large island) is ~ 12 km and the diameter of Toporkovyi (small island) is ~ 1 km. 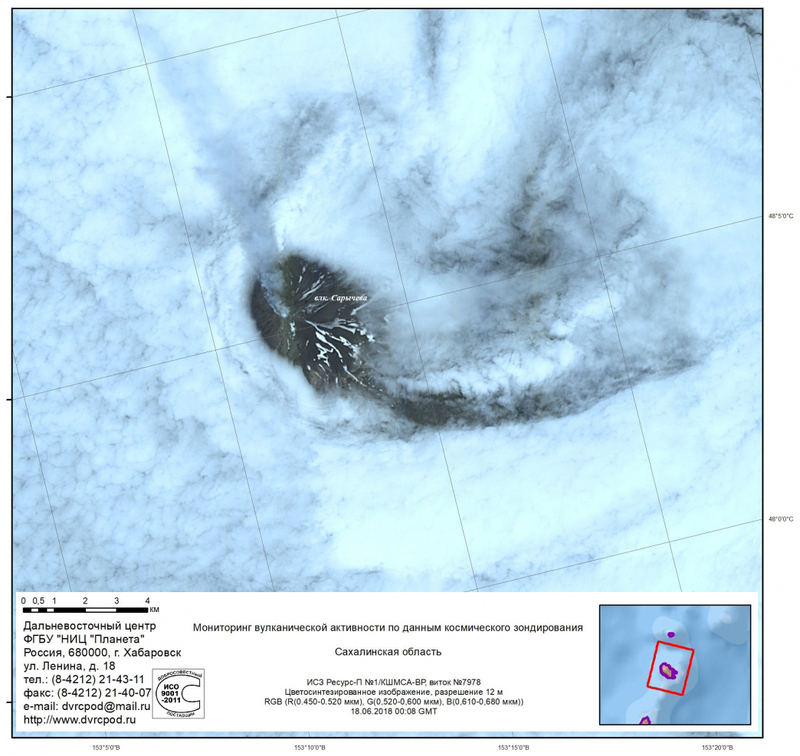 The eruption's effects were strong to the NW, around the volcano, but fieldwork confirmed that they left both the SE end of Matua Island and all of the flat Toporkovyi Island comparatively untouched. Comparison of images shows that pyroclastic flows extended the shoreline of the island, particularly NE and SW of the volcano. Courtesy of ASTER and SVERT. Broader imagery of the region also indicated more diffuse high-altitude ash clouds. Starting on 12 June, the ash spread hundreds of kilometers both E and W and to lesser extent N, a large elongate mass high in the atmosphere that closed off a huge critical area to commercial air carriers and created new problems not seen before by aviation authorities. According to Simon Carn, the Ozone Monitoring Instrument (OMI) on NASA's Aura satellite tracked a sulfur dioxide plume across the northern Pacific from Sakhalin Island and mainland Russia and E as far as Alaska (figure 5). Carn's tentative conclusion was that the eruption was also the largest sulfur dioxide event so far in 2009. Figure 5. SO2 emissions from Sarychev Peak during 10-17 June 2009 led to this composite picture of gas plumes. The emissions were measured by the OMI satellite and its support team. Note concentration-pathlength scale at bottom, in Dobson Units (DU). Courtesy of Simon Carn. By early July both atmospheric lidar instruments and the CALIPSO limb-sounding satellite had documented extended aerosol layers at 10-20 km altitude over the Northern Hemisphere. There were two potential sources for these aerosols, fires and the Sarychev Peak eruption. Fires due to biomass burning were seen around this time in both the Yukon and Alaska. Fire-generated aerosols are now known to reach 20 km altitudes (Mike Fromm, personal communication, and Fromm and others, 2004). According to Fromm, the Sarychev Peak eruptions must have at least contributed to high-altitude aerosols. As recent as mid-August, the atmospheric limb-sounding satellite CALYPSO had detected pronounced aerosol layers at 22-23 km altitude, layers also seen on MODIS visible-wavelength imagery. Fromm concluded the aerosol burden was larger than the substantial August-September 2008 eruption at Kasatochi (Alaska). The microwave limb-sounding (MLS) satellite Aura can detect multiple gases. According to a NASA website, in mid-June 2009 it detected clear signals of both SO2 and HCl across a large span of the North Pacific. Continuing activity during 16-28 June 2009. After 16 June, the eruptions entered a less energetic stage. Weak explosions continued and contained small amounts of tephra. The SVERT team visited the island during 26-28 June. Intense gas emissions came from still-hot deposits. Satellite data confirmed these gas emissions, which continued through at least 20 July. Field work and satellite observations led the team to consider the eruption to be VEI 4. Good views of the island were obtained from the sea during the 26-28 June visit by SVERT (figures 6-8). One component of fieldwork involved the GPS-aided mapping of pyroclastic deposits seen along the seashore. The team used an inflatable boat to access the shoreline (figure 9). The bulk of pyroclastic flows reached the sea (figures 10 and 11), and although wave action had substantially eroded the deposits along the coastline, the deposits clearly continued out into the sea. Weakly eroded underwater pyroclastic flows sometimes returned distinctive reflections on echo soundings. The soundings and other observations also revealed submerged deposits emitting gases and still-stirring hydrothermal exchanges. Figure 6. Photo of steam rising from Sarychev Peak as seen from the N at some time during 26-28 June. Rugged fringing older rocks can be seen protecting a beach front and tephra-covered landscape. Courtesy of SVERT. Figure 7. Photos of steam rising from the pyroclastic flows as seen from the N at some time during 26-28 June. The steaming peak is faintly visible in the background. Courtesy of SVERT. Figure 8. Photos of Sarychev Peak seen from the S, the side of the island least impacted by the eruption, where the landscape remained green and vegetated. The support vessel seen here brought scientists to the Island and gave them safe lodging during the expedition. Courtesy of SVERT. Figure 9. The field crew on a beach to inspect Sarychev Peak's recent pyroclastic flows. By the time of their 26-28 June visit, waves had eroded the fresh deposits that must have once covered this beach face. Massive, jointed rocks in the cliff backing the beach are older rocks; new deposits drape the upper cliff. Note steaming peak in the background. SVERT volcanologists (from left): Dmitrii Kozlov, Igor Koroteev, Artyom Degterev, Rafael Zharkov (far right), and Alexander Rybin (front right). Courtesy of SVERT. Figure 10. Rubbly surface of a 2009 pyroclastic flow ("pumice flow") on Sarychev Peak's W flanks. Field gear at flow front provides scale. Note the lobate form and comparatively large and consistent grain size. Courtesy of SVERT. Figure 11. Exposed tephra stratigraphy from the Sarychev Peak eruption. The scientist is standing before fresh tephra deposits along the seashore with his feet on the beach. To his side lies a well-exposed ~ 2-m-thick pyroclastic flow deposit capped by fine-grained tephra of probable air-fall origin. The fine air-fall unit covers the surface in the distance, coloring it a uniform gray. Courtesy of SVERT. The field inspection revealed three pyroclastic flows from the eruption. The team also recognized other pyroclastic material, including volcanic bombs, scoria flows, and ash. Compositionally, the field analysis suggested the eruptions were basaltic andesite. In accord with the density of the fresh blocky deposits along the sea cliff, and the clasts within them (figure 11), the team saw no floating pumice. The intense fumarolic discharges escaping the pyroclastic flows reached ~ 500°C. Fumaroles were seen most frequently associated with impacts from large volcanic bombs, and from fissures. Areas of fumarolic exhalation included sublimated minerals such as native sulfur (figure 12). The team also encountered a pond with hot water (figure 13). Figure 12. Two examples of sublimated mineral zones seen on the pyroclastic-flow surfaces from the Sarychev Peak eruption. Many such mineralized areas appeared related to bomb impacts (top). Other areas were elongate, some several meters long (bottom). Courtesy of SVERT. Figure 13. Small pond encountered on Sarychev's flanks. Cliffs and talus slopes behind the pond are tephra-draped older rocks. The green-hued water had been heated and mineralized by contact with recent eruptive products. The scientist standing in the pond estimated that the temperature was ~ 21°C. Courtesy of SVERT. Biological impacts. Prior to the eruption, the island was teeming with life and the SVERT team photographically documented many biological impacts (eg., surviving birds congregated at damaged or destroyed rookeries). The eruptions of June 2009 divided Matua Island into two sectors with a sharp and nearly linear boundary between them (eg., figure 5). On the NW side, nearest Sarychev Peak, its eruption left a dead zone. Many plants were buried by hot tephra, leaving a landscape devoid of vegetation on the current ground surface. This dead zone was bounded to the S by a deep ravine where a large mudflow had occurred, destroying ferns, thick growths of alder, and grass cover. To the SE, ashfall damaged small plants, including rhododendron, crowberry, cassiopea, and phylodoce. Perhaps 10-15% of sites visited there had ash over 10 cm thick. Especially near the dead zone, many small plants suffered burial, yet they continued to blossom. Blossoming cowberry was buried in areas with thick ashfall. Among high brush in the S part of the island, alder generally suffered little, but in some areas of ashfall (between Kruglaya mountain and the slopes of the volcano) it showed some leaf damage. The leaves of mountain ash displayed yellow rims and discolored spots. High-grasses located in the SE sector were little affected by ashfall. In the dead zone, some bird colonies remained on the old lava flows supporting the island's capes. It was difficult to estimate how many birds had died or lost nests. Many seagulls sat on the warm surfaces of the steaming pyroclastic flows. Wounded and dead seagulls found on the surfaces of pyroclastic flows were probably killed by burns after the eruption. Near the NW part of Matua Island, the team saw large flocks of sea birds aloft. On the 28th, SVERT visited seal habitats on the S portion of the island where they counted 20 eared seals and 10 fur seals. On a cape along Matua's W coast they encountered another seven eared seals. The team found no living land animals on the NW sector. On the SE sector, they found dead mice and three dead foxes. Additional geological background from SVERT. The modern edifice of Sarychev Peak occupies the bulk of Matua Island but is centered towards the NW (figure 5). The island's SE side is flat, with average elevations of 30-40 m. The island's S and E sides are covered with brush and grass. Before 25 August 1945, Matua Island supported a Japanese army base with as many as 4,000 residents. After 1945, the Soviet army occupied the island and maintained meteorological and seismic stations until a sharp decline in inhabitants at the end of the 1990's. The island still contains runways and structures. In recent years, the only people on the island were occasional visitors. The geologic literature discusses Pliocene basaltic andesite volcanoes in this region (including Toporkovyi Island and the SE part of Matua). It is probable that these are part of an ancient shield volcano. In the SE part of Matua Island is a somma of an ancient caldera (Gorshkov 1967; Markhinin 1964; Andreev and others, 1978), making Sarychev Peak an intracaldera stratovolcano. It is formed by alternating lava and tephra of mainly basalt to andesite composition (Gorshkov 1967; Andreev et.al 1978). According to Gorshkov (1967), after the major 1946 eruption the crater had both a diameter and depth of ~ 250 m, with steep, sometimes overhanging crater walls and a floor of solid lava. Modern lava flows consisted of two-pyroxene basalts and basaltic andesites vented from the central cone, forming small tongues near the crater. After the 1960 eruption, field observers encountered dense fog and were thus unable to describe the crater (Shilov, 1962). According to eye-witnesses, the crater's N walls may have collapsed. The 1976 eruption included strong emissions. Lava flows extended the W, SW, and NW slopes (Andreev and others, 1978). This eruption left the crater with a diameter of ~ 200 m and a flat bottom at a depth 50-70 m below the rim. References. Andreev, V.N., Shantser, A.E., Khrenov, A.P., Okrugin, V.M., and Hechaev V.N., 1978, Eruption of the volcano Sarychev Peak in 1976: Bull.of volcanological stations, no. 55, p. 35-40. Casadevall, T., and Thompson, T., 1995, World map of volcanoes and principal aeronautical features (1:34,268,000): U.S. Geological Survey, Geophysical Investigations Map GP-1011. Fedorchenko, V.I., Abdurakhmanov, A.I., and Rodionova, R.I., 1989, Volcanism of Kurile Island arc: geology and petrogenesis: M. Nauka, p. 239. Fromm, M., Bevilacqua, R., Stocks, B., and Servranckx, R., 2004, New Directions: Eruptive transport to the stratosphere: add fire-convection to volcanoes: Atmospheric Environment, v. 38, p. 163-165. Glavadskii, S.N., and Efremov, G.K., 1948, Eruption of the volcano Sarychev Peak in the November 1946: Bull.of volcanological stations, no. 15, p. 48-12. Gorshkov, G.S., 1948, Volcano Sarychev Peak: Bull.of volcanological stations, no. 15, p. 3-7. Markhinin, E.K, 1964, Sarychev volcano: Bull. of volcanological stations, no. 35, p. 44-58. Shilov, V.N., 1962, The eruption of volcano Sarychev Peak in 1960: The book of Sakhalin. v. 12, p.143-149. 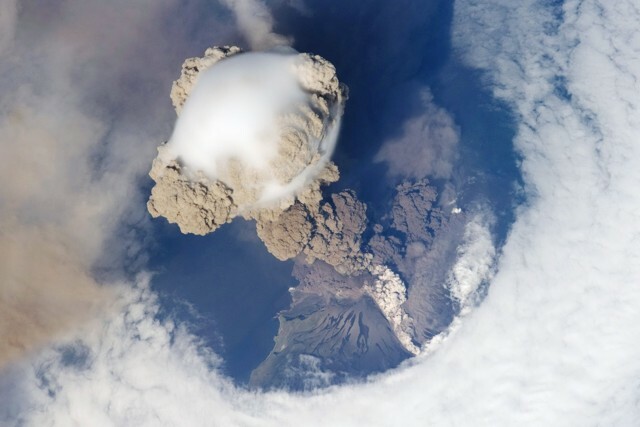 Wilkinson, M.J., 2009, Sarychev Peak Eruption, Kurile Islands (caption): NASA Earth Observatory, posted 22 June 2009 (URL: http://earthobservatory.nasa.gov/IOTD/view.php?id=38985). Information Contacts: Sakhalin Volcanic Eruptions Response Team (SVERT), Institute of Marine Geology and Geophysics (IMG & G) Far East Division Russian Academy of Sciences, 1B Science St., Yuzhno-Sakhalinsk, 693022, Russia (URL: http://www.imgg.ru/); B.W. Levin, A.V. Rybin, M.V. Chibisoba, and V.B. Gur'yanov, IMG & G; N.G. Razzhigaeva, Pacific Institute of Geography, Far East Division Russian Academy of Sciences, 7 Radio St., Vladivostok, 690041, Russia (URL: http://tig.dvo.ru/tig/); International Space Station (ISS) Expedition 20 (astronauts Gennady Padalka, Frank De Winne, Roman Romanenko, Robert Thirsk, Michael Barratt, Nicole Stott, Tim Kopra, and Koichi Wakata) (URL: http://www.nasa.gov/mission_pages/station/expeditions/expedition20/); Simon A. Carn, Department of Geological and Mining Engineering and Sciences, Michigan Technological University, 1400 Townsend Drive Houghton, MI 49931 USA; Mike Fromm, Computational Physics, Inc, 2750 Prosperity Ave, Fairfax, VA 22031, USA; NASA Astronomy Picture of the Day (URL: http://apod.nasa.gov/apod/ap090625.html); NASA Earth Observatory (URL: http://earthobservatory.nasa.gov/). Since the last eruption at Sarychev Peak, during 11-21 June 2009 (BGVN 34:06), there have been intermittent thermal anomalies detected and one ash plume. Later fieldwork also revealed lava flows from the 2009 activity. This volcano lacks a seismometer, so satellite observations are the Sakhalin Volcanic Eruptions Response Team's (SVERT) primary monitoring tool, as they are for many volcanoes of the Kuril Islands. The June 2009 explosive eruption deposited pyroclastic flows and associated tephra that changed the landscape around on NE Matua Island. Hot pyroclastic flows completely buried vegetated slopes, covered wide areas to the W, N, and E, and reached the sea (BGVN 34:06). Satellite imagery collected after June 2009 revealed lava flows on the E and SE flanks. Some imagery and photos (including radar and thermal data) and a lidar atmospheric sounding found aerosols interpreted as Sarychev Peak ash at 12 km altitude over Germany. Additional June 2009 eruption observations. Gas-and-steam emissions were frequent in July 2009, possibly with some ash on the 27th (table 1). Low-altitude plumes were visible up to 75 km away. Thermal anomalies were then detected on 21 November 2009, and 3 February, 9 March, and 27 May 2010. An ash plume was seen on 20 September 2010. Table 1. Emissions and plumes from Sarychev Peak during July 2009-September 2010. Courtesy of SVERT. 04-05 Jul 2009 Gas-and-steam emission, plumes drifted 20-75 km NW, NE, and SE to altitudes of 1.5-3 km. 08 Jul 2009 Gas-and-steam emission, plumes drifted 15 km E.
09 Jul 2009 Gas-and-steam emission, plumes containing some ash drifted 50 km E.
13 Jul 2009 Gas-and-steam emission, plumes drifted 40 km E.
14 Jul 2009 Gas-and-steam emission, plumes drifted 25 km W and NW. 15-21 Jul 2009 Gas-and-steam emission, plumes drifted 30-50 km W and S.
22 Jul 2009 Gas-and-steam emission, plumes drifted 35 km N.
27 Jul 2009 Steam-gas plume possibly containing some ash drifted 55 km NW at 3.7 km altitude. 21 Nov 2009 Thermal anomaly, steam-gas emission. 03 Feb 2010 Thermal anomaly. 09 Mar 2010 Thermal anomaly. 27 May 2010 Thermal anomaly. 20 Sep 2010 Diffuse ash plume. As previously discussed (BGVN 34:06), a scientific expedition from the Institute of Marine Geology and Geophysics Far East Division Russian Academy of Sciences (FED RAS) and Pacific Institute of Geography (FED RAS) that visited the island during 26-28 June 2009 described the eruption as explosive in character (Levin and others, 2009). Also, the explosions were sufficiently strong to have created a deep crater. A 2007 photo of the summit crater disclosed a shallow depression, the floor of which was covered in pyroclastic material (figures 14 and 15). More recent images show a newly deepened and enlarged crater (figures 16 and 17). Figure 14. Sarychev Peak's summit crater as photographed in August 2007. Pyroclastic materials and solidified lava then filled the summit crater of the volcano to its lowest level on the NW edge. Note the large area of steaming and the crater's shallow depth and pan-like character. Courtesy of A. K. Klitin. Figure 15. Almost a year after Sarychev Peak erupted spectacularly during June 2009, it displayed only degassing with steam hanging over the newly enlarged summit crater. The Advanced Land Images (ALI) on NASA's Earth Observing-1 (EO-1) satellite captured this image on 11 June 2010. Steam filled the summit crater, forming an almost perfect circle of white. A much fainter, barely discernible plume blew away from the summit toward the E. Courtesy of NASA Earth Observatory. Figure 16. Sarychev Peak's new lava flows appear in this image from 17 June 2009. This and other photos were taken with a hand-held camera from the International Space Station. From Grishin and Melekestsev (2010). Figure 17. A 22 June 2009 satellite image of Sarychev Peak, zooming in on the upper slopes and clearly showing the lava flows, a passively steaming crater, and, within the summit crater, a new deep and steep-sided explosion crater. In the NE direction, the larger crater has a diameter (rim-to-rim) of ~350-450 m. Within that lies the steep-sided crater, which has a diameter of ~250 m. Courtesy of JAXA. Satellite images from 17-18 June 2009 (such as figure 16) disclosed two, roughly 100- to 150-m-wide streams of lava that first divided ~300 m from the crater's NE edge. More detailed satellite images (including thermal images) and photos from the field analyzed after the expedition also aided the recognition of the lava flows. Grishin and Melekestsev (2010) noted that the new lava flows extended 2.4 and 2.6 km from their source at the summit crater. The area of the lava flows was estimated as 0.8 km2; the volume was estimated as ~10 x 106 m3. Analysis also determined that the lava flows proceeded downslope during the eruption's active phase. Field photos disclosed that the pyroclastic deposits overlapped and were coeval with the lava flows. In other words, lava flows moved roughly synchronous with the pyroclastic flows (figures 16 and 17). In some images, fresh snow had blanketed and remained over the bulk of Matua Island, but the lava flows and thick pyroclastic flows remained devoid of, or with limited, snow cover. This effect was attributed to continued heat radiating from the lava flows and thick pyroclastic flows. Satellite radar. Japan Aerospace Exploration Agency (JAXA) staff performed radar observations on 19 June 2009 (figure 18) using the Phased Array Type L-band Synthetic Aperture Radar (PALSAR) installed on the Advanced Land Observing Satellite (ALOS). Analysts compared an earlier radar image, from 14 March 2007, to detect surface changes between those two dates; many of the changes were attributed to the 2009 eruption (figure 18). Figure 18. PALSAR amplitude images acquired before (bottom; on 14 March 2007) and after (top; on 19 June 2009) the eruption at Sarychev Peak. The same observational modes were used for both images (taken on descending orbit with an off-nadir angle of 34.3 degrees). PALSAR radar depict the target area without masking by weather clouds, steam or other volcanic gases. Courtesy of JAXA. The two images revealed areas with profound changes (circled) both around the crater and at many points along the coast. Analysts interpreted the shoreline changes as due to pyroclastic flows or lahars, which issued from the crater and transported material radially. On the upper slopes, the strong radial pattern was primarily due to pyroclastic flows and, in some locations, lava flows. Lidar. Mattis and others (2009) discussed aerosol data from lidar soundings over Leipzig, Germany, during the summer of 2008 through the first half of 2009. They associated high backscatter seen on 1 July 2009 with aerosols from Sarychev Peak's eruption and estimated the main peak from aerosols as residing at ~12 km altitude. Earlier backscatter peaks were attributed to Okmok (Aleutians, 15-km altitude); Kasatochi (Aleutians, 15.2 km); Shiveluch (Kamchatka, 8.8 km); Cleveland (Aleutians, 6 km); and Redoubt (Alaska, 20 km). The authors noted that, prior to the onset of the aerosol layers seen in the summer of 2008, their measurements in the previous 12 years lacked any major effects from volcanic aerosols over Germany. References. Grishin, S.Yu., Melekestsev, I.V., 2010, Lava flows from the 2009 eruption of Sarychev Peak, the Central Kuriles, Bulletin of Kamchatka Regional Association "Educational Scientific Center"; Earth Sciences, no. 1 (15), p. 232-239. Levin, B.V., Rybin, A.V., Razzhigaeva, N.G., and others, 2009, Complex Expedition of the "Volcano-Sarychev 2009" (Kuril Islands), Bulletin Far East Division, Russian Academy of Sciences, no. 6, p. 98-104. Mattis, I., Seifert, P., Muller, D., Tesche, M, Hiebsch, A., Kanitz, T., Schmidt, J., and Finger, F., 2009, Volcanic aerosol layers observed with multi-wavelength Raman lidar over Europe since summer 2008, in Proceedings of the 8th International Symposium on Tropospheric Profiling, Delft, The Netherlands, October 2009. Eds. A. Apituley, H.W.J. Russchenberg, W.A.A. Monna, ISBN 978-90-6960-233-2. Information Contacts: Sakhalin Volcanic Eruptions Response Team (SVERT), Institute of Marine Geology and Geophysics (IMG&G) Far East Division Russian Academy of Sciences (FED RAS), 1B Science St., Yuzhno-Sakhalinsk, 693022, Russia (URL: http://www.imgg.ru/); B.W. Levin, A.V. Rybin, M.V. Chibisoba, and V.B. Gur'yanov, IMG&G; N.G. Razzhigaeva, Pacific Institute of Geography FED RAS, 7 Radio St., Vladivostok, 690041, Russia (URL: http://tig.dvo.ru/tig/); S. Yu. Grishin, Institute of Biology and Soil Science FED RAS, 159 Prospect Stoletiya, Vladivostok, 690022, Russia; I.V. Melekestsev, Institute of Volcanology and Seismology FED RAS; A.K. Klitin, Sakhalin Research Institute of Fisheries and Oceanography, Yuzhno-Sakhalinsk, Russia; Gennady Padalka, Frank De Winne, Roman Romanenko, Robert Thirsk, Michael Barratt, Nicole Stott, Tim Kopra, and Koichi Wakata (astronauts), International Space Station Expedition 20 (URL: http://www.nasa.gov/mission_pages/station/expeditions/expedition20/, http://www.eorc.jaxa.jp/ALOS/img_up/l_pan_sarychev_090622.htm); NASA Earth Observatory (URL: http://earthobservatory.nasa.gov/). Sarychev Peak, one of the most active volcanoes of the Kuril Islands, occupies the NW end of Matua Island in the central Kuriles. The andesitic central cone was constructed within a 3-3.5-km-wide caldera, whose rim is exposed only on the SW side. A dramatic 250-m-wide, very steep-walled crater with a jagged rim caps the volcano. The substantially higher SE rim forms the 1496 m high point of the island. Fresh-looking lava flows, prior to activity in 2009, had descended in all directions, often forming capes along the coast. Much of the lower-angle outer flanks of the volcano are overlain by pyroclastic-flow deposits. Eruptions have been recorded since the 1760s and include both quiet lava effusion and violent explosions. Large eruptions in 1946 and 2009 produced pyroclastic flows that reached the sea. There is no Deformation History data available for Sarychev Peak. A cloudcap obscurs the dramatic, steep-walled summit crater of Sarychev volcano, one of the most active volcanoes of the Kuril Islands. Sarychev occupies the NW end of Matua Island in the central Kurils in this NASA Space Shuttle image (with north to the top). The andesitic central cone was constructed within a mostly buried 3-3.5 km wide caldera; an older volcano forms the SE part of the island (lower right). Fresh-looking lava flows descend all sides of Sarychev Peak. The small island of Toporkovyi is partially visible at the right-center. NASA Space Shuttle image ISS005-E-17796, 2002 (http://eol.jsc.nasa.gov/). One of the largest historical eruptions in the Kuriles took place June 11-16 from Sarychev Peak. This NASA Space Shuttle view on June 12 shows an eruption plume that reached 16-21 km altitude and pyroclastic flows that reached the sea and extended the shoreline in some areas. The main explosive phase ended on June 16, but weak explosions containing ash continued prior to arrival of a field team July 26-28, when no eruptive activity was observed. NASA Space Shuttle image Image ISS020-E-9048, 2009. There are no samples for Sarychev Peak in the Smithsonian's NMNH Department of Mineral Sciences Rock and Ore collection. Large Eruptions of Sarychev Peak Information about large Quaternary eruptions (VEI >= 4) is cataloged in the Large Magnitude Explosive Volcanic Eruptions (LaMEVE) database of the Volcano Global Risk Identification and Analysis Project (VOGRIPA).